Click the links above to go to the lists of properties in each street. There are also links to maps and to stories inspired by some of the documents discovered. An associated strand of the project has produced a searchable database of people admitted to the Guild of Freemen of Berwick-upon-Tweed, in the period 1800-1940. 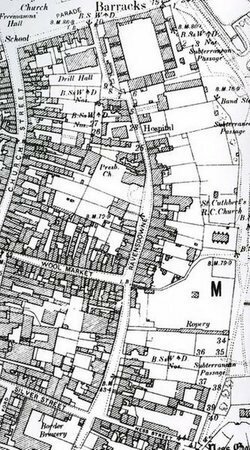 The numbering of houses shows some inconsistencies over time, but an outline of the development of properties in these areas can be traced in comparative maps – for 1852, 1897, and 1923. Through the links below, the maps can be viewed in detail in a PDF format. LOW GREENS and HIGH GREENS. Click this link to see large-scale maps for 1852, 1897, and 1923. Use the controls in your browser or Adobe Acrobat to enlarge the detail of the maps. RAVENSDOWNE. Click this link to see large-scale maps for 1852, 1897, and 1923. As part of the project, a group of volunteers explored the archives as a source of inspiration for Creative Writing. Some of the resulting stories can be read on the OUR FAMILIES’ STORIES page.